National institute of Wind Energy (NIWE) has extensive experience in onshore wind resource assessment, testing & certification of wind turbines and has estimated and validated potential across the country for benefit of wind Industry. NIWE has handed with responsibility of facilitating offshore wind in our country. Indian peninsula has blessed with 7500 kms of coast line. Preliminary assessment has started in the way of installing Met Masts which acts as representative of offshore wind potential. 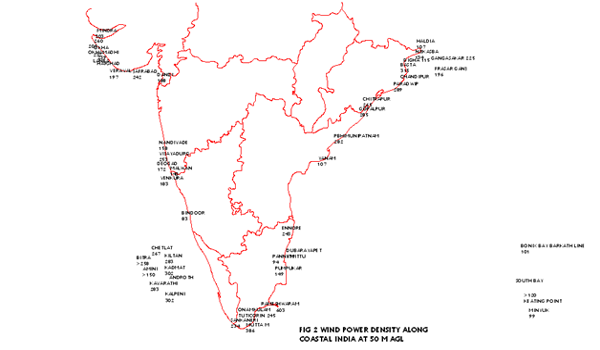 74 nos of met masts with various heights has been installed across the coast lines. 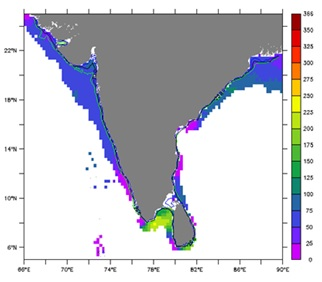 Establishment of potential in the coast line was also done by Indian National Centre for Ocean Information Services (INCOIS) under Ministry of Earth Sciences, Government of India with available secondary data. Offshore wind has proved successful across European countries and in Asia by China and Japan. Later stages, India has initiated the preliminary works of offshore wind development under the European Union Funded projects, Facilitating Offshore Wind in India (FOWIND) and First offshore Wind Project in India (FOWPI). 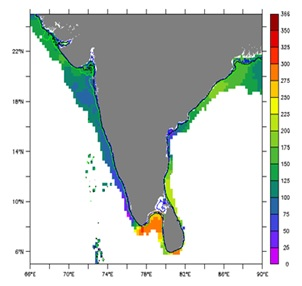 NIWE in collaboration with FOWIND consortium has done studies resource assessment and preliminary feasibility studies along the Indian coast and demarcated eight zones each in Gulf of Khambat, Gujarat and Gulf of Mannar, Tamil nadu. Based on FOWIND report, NIWE has initiated the verification and validation of the studies. FOWPI consortium is planning to do preliminary studies for developing wind farms in a specific area demarcated by FOWIND. Working in offshore poses lots of challenges which can be tackled with proper planning and knowledge through tools and resources available. More thorough understanding and data collection of key met-ocean phenomena such as wind velocity and shear; low-level jets; tidal and current velocities; wave characteristics, geotechnical data relating to surface and subsurface characteristics, seasonal and diurnal variations, and the interaction among these conditions is required. Data requirements can be defined either by established standards or known engineer needs.  Data and information requirements include information gleaned from observations as well as estimated and modeled output. Requirements of information may vary from typical users such as for Developers/Owners will Evaluate a potential site on a wide range of criteria, including resource quality, ability to obtain permits, access to transmission, impact on and interactions with the surrounding environment, consistency with current land uses, and constructability. Financial Institutions will provide financial support for developments based on the bankable data provided by the agency/developer. The information gathered will help in many aspects such as Facility design, Energy projections, technology design and validation, performance monitoring, operations monitoring and site safety, forecasting. To estimate the long term revenue stream, there should be a record of system downtime for extreme events to be accurately described. Concerned areas where lack of information include the frequency of extreme events and their impacts in power production, energy loss due to wake effects and an understanding of precipitation and other particles and their impact on energy production. Also, forecasting for the coastal zone is also complicated by the variable nature of the ocean, including sea surface temperatures (SSTs), near-surface currents, and the full spectrum of surface waves. For shorter-term forecasts, the influence of the ocean may be adequately captured by a static initial ocean state (especially for SSTs), but at longer ranges it may be necessary to run fully coupled atmosphere-ocean-wave models that can capture changes to the ocean state over the forecasted timeframe. Forecasting of winds in the coastal zone may be limited by the inability of presently used model parameterizations to represent all of the important sub-grid-scale processes that occur. Examples include not only air-sea interaction, but also turbulent mixing, boundary-layer fog/cloud dynamics, and the dynamics of shallow internal boundary layers in offshore flow. In this scenario, the concept of Offshore Wind Portal jointly handled by NIWE /FOWPI consortium will help potential developer / Research scholars / financial institutions to get an idea about offshore wind energy and also its progress in the country to showcase transparently the activities for developing offshore wind in India. Offshore Resource Assessment And Design Conditions, A Data Requirements And Gap Analysis For Offshore Renewable Energy Systems. US Department of Energy, 2017. Web. 01 Jan. 2017.